Summer vacation is here, and for kids that means camp, riding bikes, fishing, swimming, exploring, baseball, carnivals, barbecues, video games, and of course, watching movies. Parents can sometimes get flummoxed trying to find something for kids to watch, often skimming through only the latest releases. Happily, Netflix currently has a wide selection of interesting movies, old and new, that may become great summer memories for future generations. The big deal about The Muppet Movie (1979) when it first opened is that, on television, the Muppets were very clearly operated from below a stage; in the movie, they are shown ambulatory, and even riding bikes. It was, and still is, a surprisingly sophisticated—and funny—entertainment, a modern take on the road movie as well as the rise-to-fame movie and the let’s-put-on-a-show movie. It begins in a screening room as Kermit, Miss Piggy, Fozzie, and the gang get ready to watch their finished creation, and it continually breaks the rules, such as characters consulting the script in the middle of a scene. It includes all kinds of impressive human guest stars, from funnymen Steve Martin, Richard Pryor, Mel Brooks, and Bob Hope to heavyweights like Orson Welles. The lovely, funny songs by Paul Williams, including the Oscar nominee “The Rainbow Connection,” have barely aged. We love it as only a pig could love a frog. Though it’s set in a crummy neighborhood and does a great job establishing that world, the PG-rated family-friendly film Akeelah and the Bee (2006) focuses on positive change. Little 11 year-old Akeelah (the wonderful Keke Palmer) lives with her single mom (Angela Bassett); her dad was shot and killed on his way home from work. But thanks to her father’s brains, Akeelah inherited a passion for spelling. When this is revealed, she is assigned to a tutor and prepares to go to the National Spelling Bee. The tutor is the stern, upright Dr. Larabee (Laurence Fishburne), who is really like a tweedier version of the even-toned Morpheus (of The Matrix). Whereas this material could have easily turned into one-note, routine filmmaking, director Doug Atchison keeps it feeling rich, rounded, and honest. And, thankfully, when Bassett and Fishburne meet onscreen, their interaction is much warmer than it was in What’s Love Got to Do With It?. Directed by Ron Clements and John Musker (The Little Mermaid and Aladdin), Treasure Planet (2002) is one of the few Disney-animated features that fared better with reviewers than it did with audiences. It ended up a fairly large money-loser, but it’s very much worth catching up with today. It’s an outer-space version of R.L. Stevenson’s Treasure Island, and a father-figure/son bonding story at the same time. Joseph Gordon-Levitt provides the voice of young Jim Hawkins, who boards a spaceship to find treasure hidden somewhere in the galaxy. Aboard the ship is a cyborg cook known as John Silver (voiced by Brian Murray), who turns out to be something other than he seems. The filmmakers tried a combination of hand-drawn characters with computer generated backgrounds, and the result is quite breathtaking, with some unique ideas about space travel. The movie hits all the right notes; it’s funny, touching, and exciting. Martin Short offers comic relief as a loony robot, and Emma Thompson and David Hyde Pierce provide their voices as well. Mixing live action and computer animation, The Adventures of Rock and Bullwinkle (2000) was mostly loathed at the time of its release, and it was a flop, but it’s a film of great talent and many pleasures. Writer Kenneth Lonergan received an Oscar nomination the same year for You Can Count on Me, and director Des McAnuff is usually associated with Shakespeare and Broadway. Plus the great Robert De Niro plays Fearless Leader! The story has the cartoon versions of Rocky (voiced by the original, June Foray) and Bullwinkle (voiced by Keith Scott), entering the real world to stop the latest evil plan by Boris (Jason Alexander) and Natasha (Rene Russo). Our heroes get some help from a cute FBI agent (Piper Perabo). Some of the jokes are not that clever, and the animation seems a bit rushed, but it has just the right pace and attitude to generate a good amount of fun. 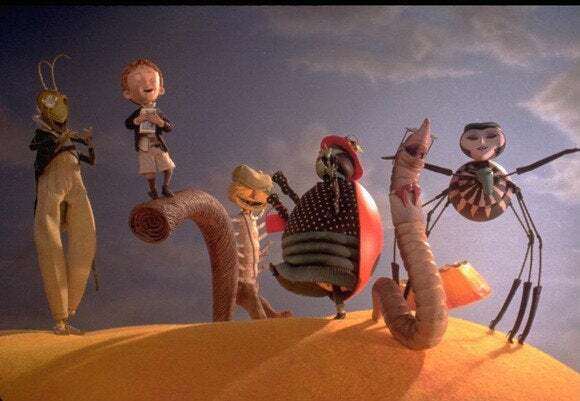 Director Henry Selick, who actually made Tim Burton’s The Nightmare Before Christmas, gets full credit this time for his imaginative, offbeat adaptation of Roald Dahl’s novel. James and the Giant Peach (1996) begins in live action as James (Paul Terry) struggles through his days under the care of his monstrous aunts (Joanna Lumley and Miriam Margolyes). Fortunately, when a giant peach grows in the garden, James crawls inside (and turns into a stop-motion animated character), befriends the bugs that live there, and takes off on an incredible adventure. Selick’s vision is fairly dark and icky, and though some lightweight Disney-type alterations creep in from time to time, it’s still a great-looking, entertaining movie. Susan Sarandon, Richard Dreyfuss, and David Thewlis lend their voices, and Pete Postlethwaite narrates and plays a live-action character. Claude Nuridsany and Marie Pérennou’s amazing documentary Microcosmos (1996) runs just 75 minutes but apparently took three years to film. The filmmakers gently lower their camera to ground level and capture the close-up behaviors of many different kinds of insects, ranging from ants collecting food and snails embracing, to beetles fighting. The cinematography, which sometimes employs time-lapse, as well as creative editing, makes the bugs appear larger than life, with all their beautiful, weird details in full view. The soundtrack features authentic scratching and scuffling noises that complete the immersive experience. The movie is rated G, and it’s very much recommended to children who are fascinated with all things squirmy. 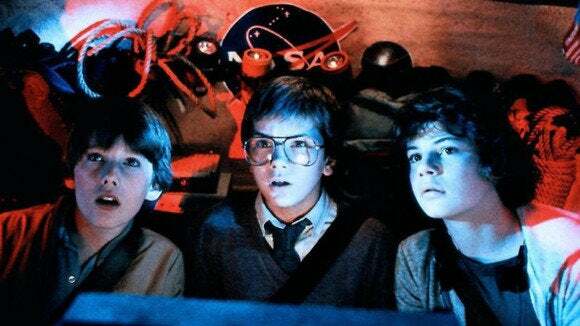 A year after his summertime hit Gremlins, director Joe Dante tried for a follow-up with Explorers (1985). It didn’t fare as well, but it just might have been too far ahead of its time. Today, movies like Super 8 and Earth to Echo try to repeat its magic formula (and a remake is in the works). Three boys, two of them played by young Ethan Hawke and River Phoenix, dream up a way to build a spaceship and launch it into outer space, looking for exotic aliens, but finding something weirdly different. A one-of-a-kind filmmaker, Dante is a die-hard fan of old sci-fi movies and cartoons, and he often pays tribute to them in his films. But he’s also a master satirist, using the genres and his own wily sense of humor to say a little something about the human condition. Yet there’s enough fun stuff here to appeal to younger viewers as well. One of the earliest masterpieces made by Walt Disney, Dumbo (1941) is also one of the wildest, weirdest, funniest, and most touching of all animated films. Telling the story of a young elephant with extra-large ears who comes to believe in himself, it contains a number of mind-blowing sequences. In one, Dumbo and his mentor Timothy Q. Mouse accidentally drink champagne, get drunk and see “Pink Elephants on Parade.” In another, Dumbo learns to fly with the help of several crows, who sing a terrific song (“When I See an Elephant Fly”) and dance on the edge of cultural stereotyping. Or, most heartbreaking, there’s the scene when Dumbo tries to visit his mother, caged up after a rampage while trying to protect her son. Guided by Ben Sharpsteen, all of this comes packed into a swift-moving 64-minute package, filled with gorgeous, fluid, colorful animation that continually suggests majesty and wonder. It’s not often that Netflix allows for streaming of classic theatrical short cartoons, but here’s one of the all-time best, Disney’s Three Little Pigs (1933). Released as one of Disney’s Silly Symphonies series—which emphasized unique characters and stories set to music—it was a huge success, an Oscar-winner, and an early example of unique characterization in cartoons; each pig had his own physical movements that highlighted his personality. Even the song, “Who’s Afraid of the Big Bad Wolf?” became a phenomenon. This collection includes the two official sequels, The Big Bad Wolf (1934) and Three Little Wolves (1936), plus Three Blind Mouseketeers, Elmer Elephant (both 1936), Chicken Little (1943), and Lambert the Sheepish Lion (1952). Netflix has four other “Disney Animation Collections,” including Vol. 1: Mickey and the Beanstalk; watch it for the great color Mickey Mouse cartoons Thru the Mirror (1936) and Brave Little Tailor (1938).